I’ve never been one to pass up an opportunity to eat a seven-course meal. 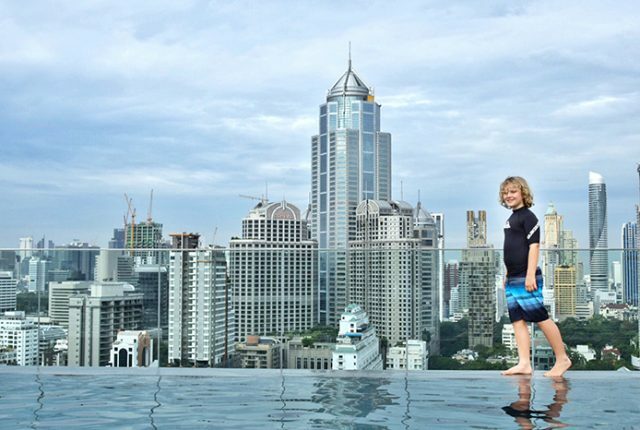 So, of course, when I’m invited to enjoy the Chef’s Degustation at The Siam Bangkok, I not only say yes, I practically cartwheel my way into the dining room. 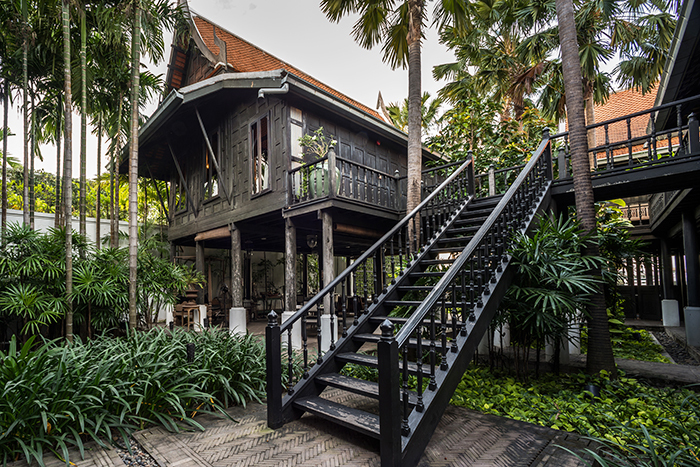 The Siam Hotel Bangkok, part of the Legend Collection from Preferred Hotels & Resorts, is a black and white boutique beauty that’s a little bit luxury and a whole lot rock n roll. 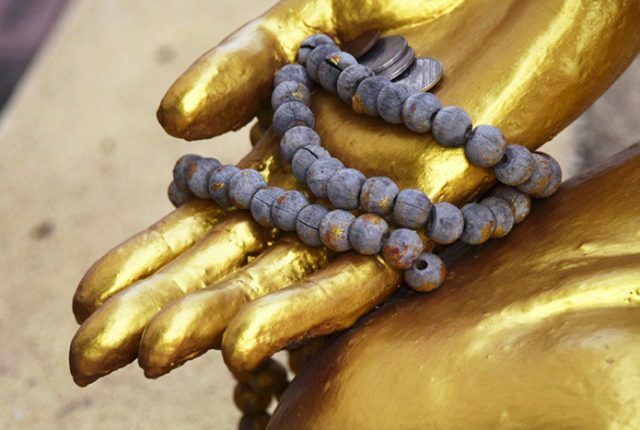 That credit for which must go to its owner and creator, Thai rock star and award-winning actor Kriss Sukusol Clapp. 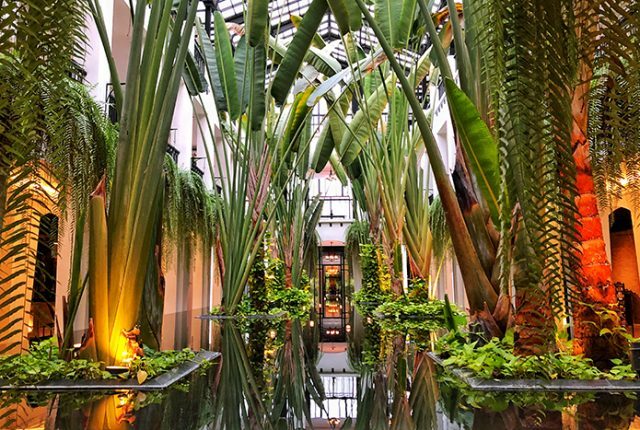 Whoever is responsible for the utter perfection of the soul-filled sanctuary, The Siam has me spinning right round, baby … just like the vinyl records in the music room, where you can tinkle the ivories or spin a few tunes on the record player. This hotel has it all and at the very moment I find myself torn between choosing tunes, movies in the luxurious movie room, strolling in the glorious gardens, lounging in the pool, indulging in the out of this world day spa or never leaving the sanctuary of my dream suite, a new contender for my attention shows itself in the form of the very talented Chef Damri Muksombat. 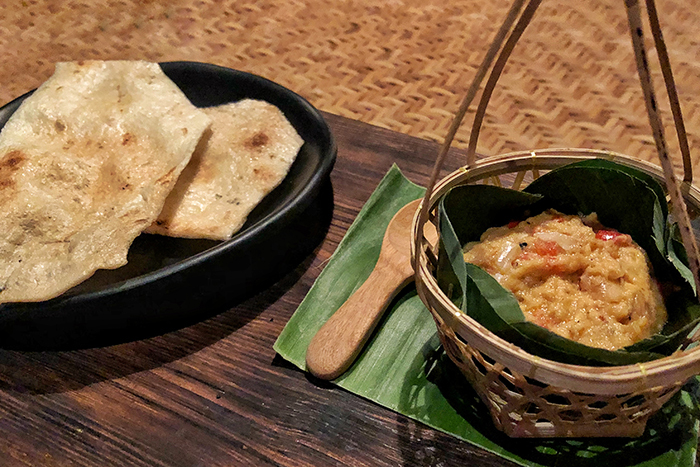 The enthusiastic and creative Chef Damri, who has helmed some of Thailand’s top restaurants, along with his talented team, produce cuisine that is nothing short of sublime. From breakfast to dinner, every bite of every meal is a winner. 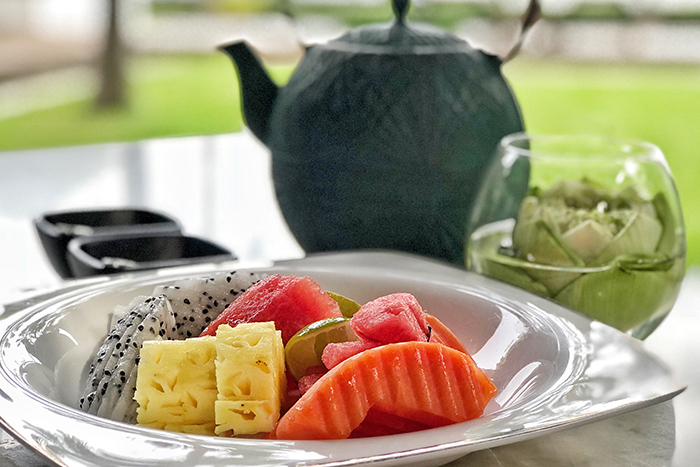 I start the day with delicate Thai-style stir fry noodles that pack all of the flavour without the usual oiliness, followed by the freshest local fruit. 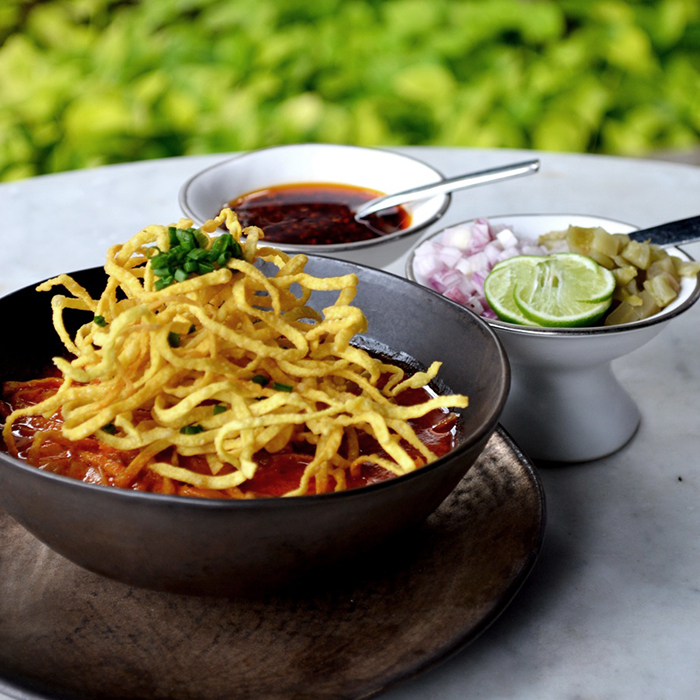 At lunch I virtually bathe in a big noodle packed bowl of soupy Khao Soi curry, that is so good (and so wonderfully spicy) every mouthful has me jiggling with excitement. 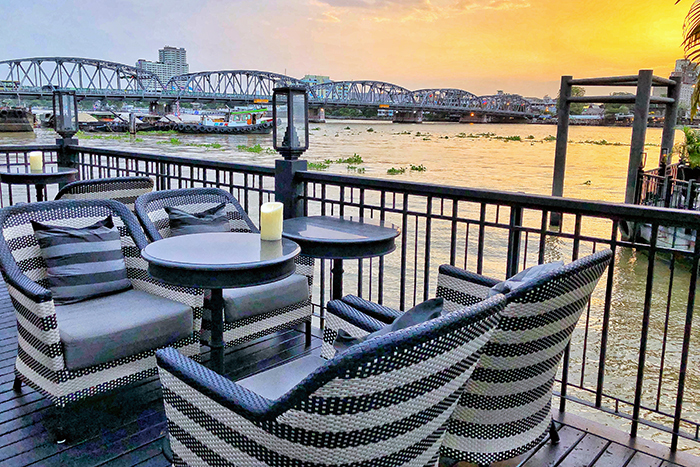 But it is over the intimate seven-course dinner in a private room of The Siam’s signature Thai restaurant, Chon, that I surrender to what is easily the finest meal I’ve enjoyed in ten days of eating my way around Thailand. 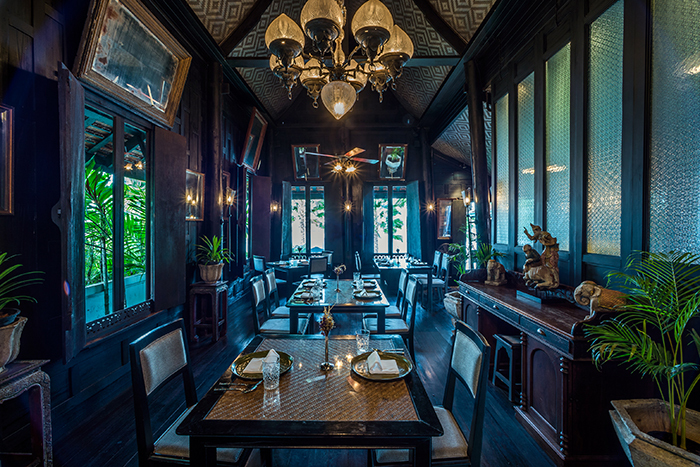 Set within a gorgeous huddle of traditional teakwood houses that were once part of the home of a Thai socialite, Chon allows guests to enjoy extraordinary Thai creations in the same rarefied space that Jackie Kennedy, John Rockefeller and Henry Ford were once entertained. 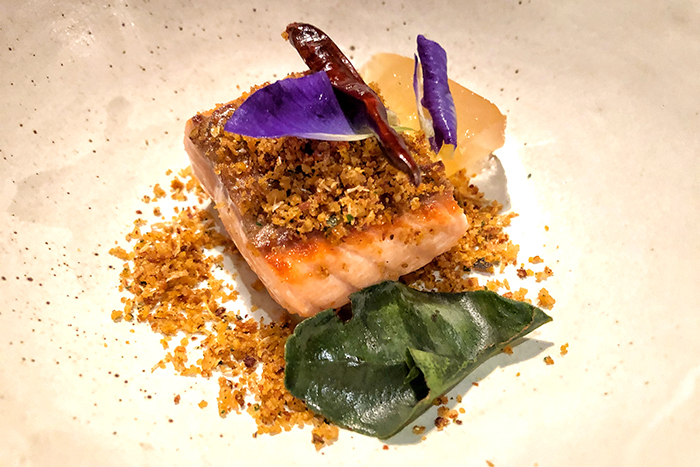 And I’m sure even those discerning icons of taste and luxury would be raving fans of the eight-course Chef’s Degustation Menu, created from the freshest and finest produce. 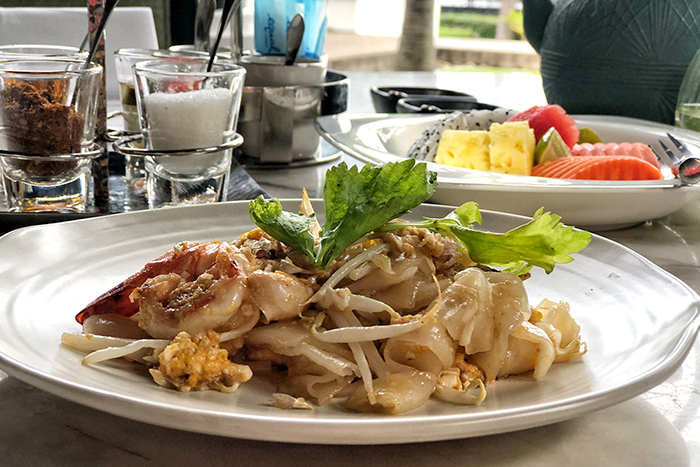 The entire meal is an intricate and clever dance through the flavours of Thai cuisine with perfectly balanced flavours and textures in dishes that are as simple as they are complex. 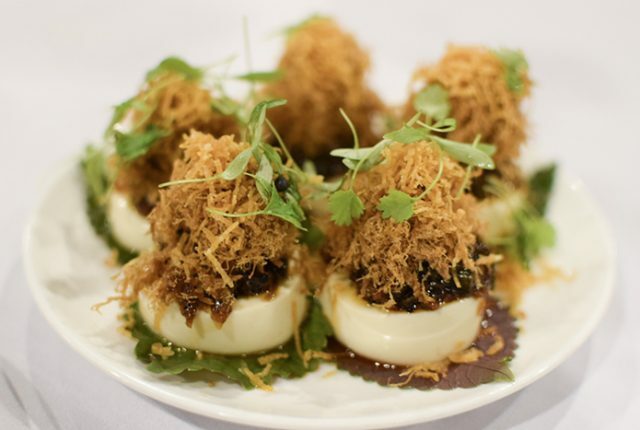 So, what exactly is on the menu at the Chef’s Degustation at The Siam Bangkok? 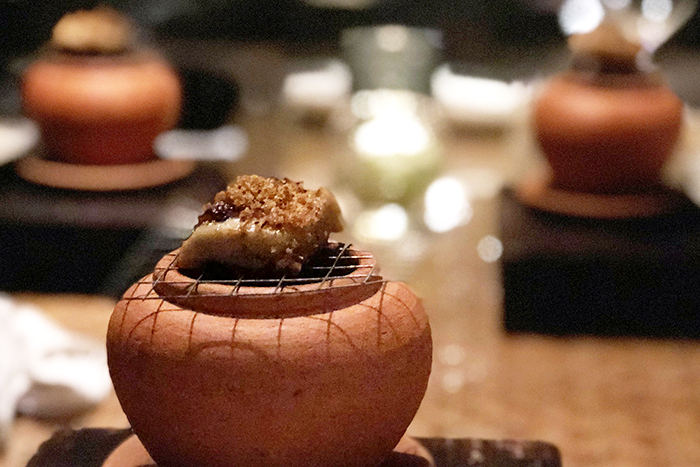 We start with luscious lychee martinis on the wharf before heading into the private dining room to snack on Kao Kriab Wow, crispy, flame-charred rice crackers paired with a spicy fish dip that’s so good I scrape the plate clean. 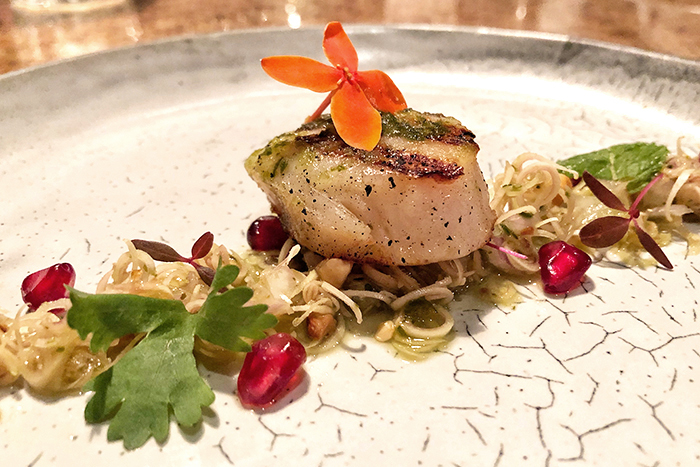 The seven-courses begins with Yum Tra Krai Hoishelll, firm yet tender Hokkaido scallops served with a salad of lemongrass and edible flowers, a beautifully clean dish, springing with flavour and preparing the palate for the meal to come. There’s smoky and aromatic Gaiyang, char-grilled sous vide chicken, that bursts juicily in the mouth. Pla Him A Neung, soya steamed deep sea snow fish, appears and disappears into my belly in record time. Yum Som O, a vibrant pomelo salad with sliced young kale and fresh watermelon, cleanses the palate for the next course, Tom Yu Pla, a clever creation combining a gel like triangle of dehydrated tom yum served alongside perfectly pan-seared Norwegian salmon, seasoned with lemongrass, kaffir lime leaves and galangal with a hit of sourness from lime juice and heat from dried chilli. It is so good I am tempted to order a second. Instead I dive into Panang Nua Phad Pak Tarad, a wagyu beef with fragrant red curry sauce accompanied by wok-fried local greens and steamed rice. 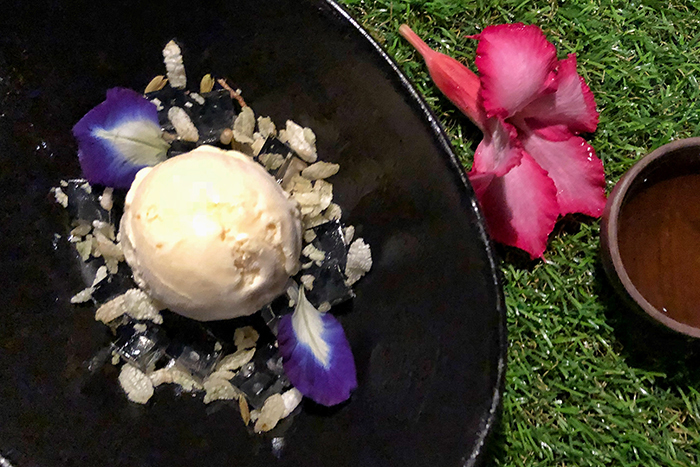 Our dinner ends in sweet perfection with Itim Khao Hom Ma Li, a lovely dessert of milky jasmine rice ice cream that leaves me wonderfully satiated yet craving a repeat of the whole experience. 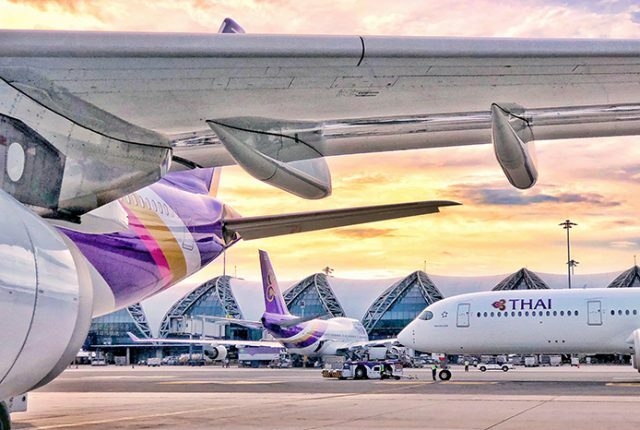 The Siam is a member of the Legend Collection from Preferred Hotels & Resorts and travellers can access exclusive member rates and earn reward points at the hotel (and others in the group) through membership of their free I Prefer Hotel Rewards programme. Disclosure: While I was privileged to be a guest of at the Chef’s Degustation at The Siam, Bangkok, all cocktail supping, extreme scoffing and opinions are my own. Chef during tour is very good idea.. i will suggest this to my tour operator.. thanks for the idea.